After chastising some fakery claiming to be advanced philosophy for not being advanced at all, but a form of cretinism, lets’ go back to basics: One thing that was definitely wrong with lots of “democrats” was their professed admiration for Reagan (Obama was of that persuasion). Patrice Ayme to Bill: Absolutely what I have been saying for more than a decade. I discovered this when my (personal) friend Obama became president. The change was amazing: the big boys were in charge. It was as if Obama had just been hired by an incredibly powerful corporation hidden from the sight of the public. My closest family members immediately lied to me in an extravagant way: they had been told my influence on Obama was “unpredictable”… If there is an individual one want to be able to predict, it’s the president, when one is a donor. There is no way out of this, but for the institution of DIRECT DEMOCRACY running in parallel. Direct democracy means the We The People vote LAWS directly. Congress would then be charged with refining the laws in question. That system already exists in Switzerland. It is increasingly used, and it’s a great success. It explains why Switzerland is so wealthy while at the same time, much egalitarian legislation has been passed recently (with more to come). PA: I grew up in Africa. I saw crocs eat. I don’t pity them. Nor do they expect pity. Hey, once in a while, I even agree with the Qur’an, and verily, that’s no hypocrisy. This entry was posted on February 5, 2019 at 11:59 pm and is filed under Uncategorized. You can follow any responses to this entry through the RSS 2.0 feed. You can skip to the end and leave a response. Pinging is currently not allowed. 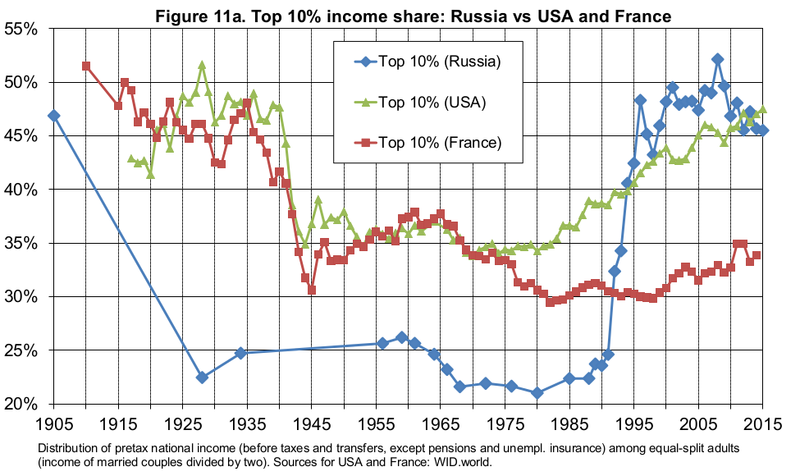 See the sharp drop in the tend line from 1965-70 in both France and the USA. Correlates with the best popular music in modern history and the last time that young people had hope for the future. LBJ used his electoral mandate to launch anti-poverty programs. Obama used his electoral mandate to ladle more wealth onto the banksters to keep the trendline heading in the wrong direction. And it does appear France has kept its Neoliberals aka Neocons under control better than USA USA or Russia (it is sad to see what the Harvard boys did to Russia…). The global dictatorship of the billionaire class is reaching insane proportions.